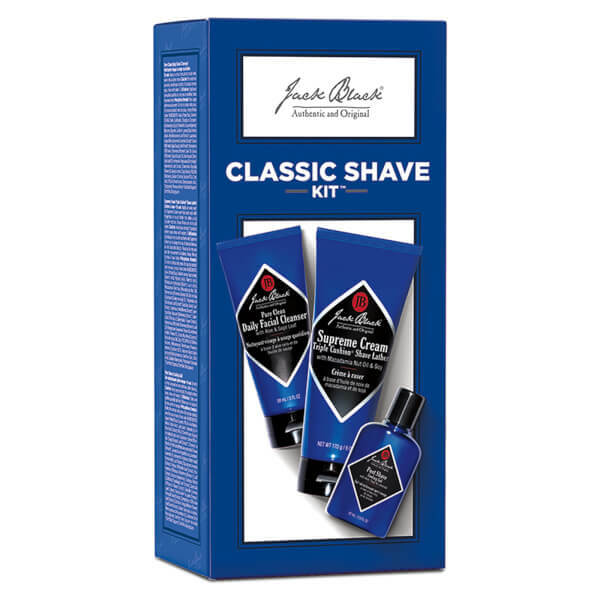 The all-inclusive set for the perfect, pain-free shave. Includes a gentle cleanser, a conditioning shave formula, and a moisturizing after-shave treatment. Espuma de afeitado: Extender una capa uniforme de Supreme Cream sobre el rostro y cuello con las yemas de los dedos o con una brocha de afeitado. Masajear hasta formar espuma realizando movimientos circulares. Afeitar. Aclarar la piel con agua templada. Gel efecto frío: Extender una cantidad del tamaño de una moneda del gel sin alcohol sobre el rostro y el cuello para ayudar a aliviar la irritación y reducir el enrojecimiento. Limpiador: Aplicar una pequeña cantidad sobre la piel humedecida, masajear para crear espuma y aclarar. Shave Lather: Water (Aqua), Sodium Lauroyl Sarcosinate, Stearic Acid, Myristic Acid, Palmitic Acid, Potassium Hydroxide, Lauric Acid, Glycerin, Macadamia Ternifolia (Macadamia) Nut Oil, Simmondsia Chinensis (Jojoba) Oil, Glycine Soja (Soybean) Oil, Peucedanum Ostruthium Leaf Extract*, Buddleja Davidii Leaf Extract*, Artemisia Umbelliformis Extract*, Leontopodium Alpinum (Edelweiss) Extract*, Calendula Officinalis (Calendula) Flower Extract, Rosmarinus Officinalis (Rosemary) Leaf Oil, Pelargonium Graveolens Flower Oil, Anthemis Nobilis Flower Oil, Cocos Nucifera (Coconut) Oil, Cetyl PEG/PPG-10/1 Dimethicone, Perfluorononyl Dimethicone, Phenoxyethanol, Disodium EDTA, Butylene Glycol, Iodopropynyl Butylcarbamate, Xanthan Gum. Cooling Gel: Water (Aqua), Glycerin, PEG-8, Glyceryl Acrylate/Acrylic Acid Copolymer, PEG/PPG-14/4 Dimethicone, Hamamelis Virginiana (Witch Hazel) Extract(1%), Aloe Barbadensis Leaf Juice*, Lavandula Angustifolia (Lavender) Oil, Salvia Officinalis (Sage) Leaf Extract*, Chamomilla Recutita (Matricaria) Flower Extract*, Rosmarinus Officinalis (Rosemary) Leaf Extract, Melissa Officinalis (Balm Mint) Leaf Extract, Foeniculum Vulgare (Fennel) Fruit Extract, Equisetum Arvense Extract, Imperata Cylindrica Root Extract, Tussilago Farfara (Coltsfoot) Leaf Extract, Camellia Oleifera Leaf Extract, Calendula Officinalis Flower Extract, Symphytum Officinale Leaf Extract, Epilobium Angustifolium Flower/Leaf/Stem Extract, Allantoin, Sodium Hyaluronate, Polysorbate 20, Carbomer, Xanthan Gum, Sodium Hydroxide, Sodium Benzoate, Phenoxyethanol. Cleanser: Water (Aqua), Sodium C14-16 Olefin Sulfonate, Disodium Cocoamphodiacetate, Aloe Barbadensis Leaf Juice*, Cocamidopropyl Betaine, Sodium Lauroyl Oat Amino Acids, Glycol Distearate, PEG-150 Distearate, Hamamelis Virginiana (Witch Hazel) Extract, Glycerin, Lavandula Angustifolia (Lavender) Extract*, Salvia Officinalis (Sage) Leaf Extract*, Chamomilla Recutita (Matricaria) Flower Oil, Rosmarinus Officinalis (Rosemary) Leaf Oil, Salvia Officinalis (Sage) Leaf Oil, Backhousia Citriodora Oil, PEG 8-Dimethicone, Sodium Chloride, Sodium PCA, Cetyl Alcohol, Citric Acid, Benzyl Alcohol, Dehydroacetic Acid.